EFC was present at the 11th international INTERSOL 2012 conference organised in Paris from 27th to 30th March 2012. 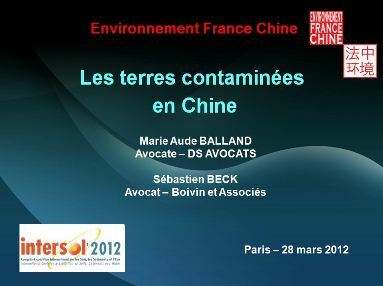 Marie-Aude BALLAND and Sebestien BECK made a presentation on the following theme: “Legal issues concerning contaminated soil in China”. Click here for a summary of this presentation. 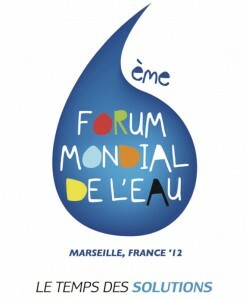 The sixth World Water Forum was held in Marseille from 12th to 17th March 2012. The World Water Forum gives politicians and decision-makers the opportunity to exchange ideas and work together in an international context on the issues concerning water. During this event, an agreement was signed on the 2nd phase of the French-Chinese co-operation on the pilot basin of the River Hai, in the presence of M. Chen Lei, Minister of Water Resources and M. Serge Lepeltier, French Ambassador in charge of negotiations on climate change. 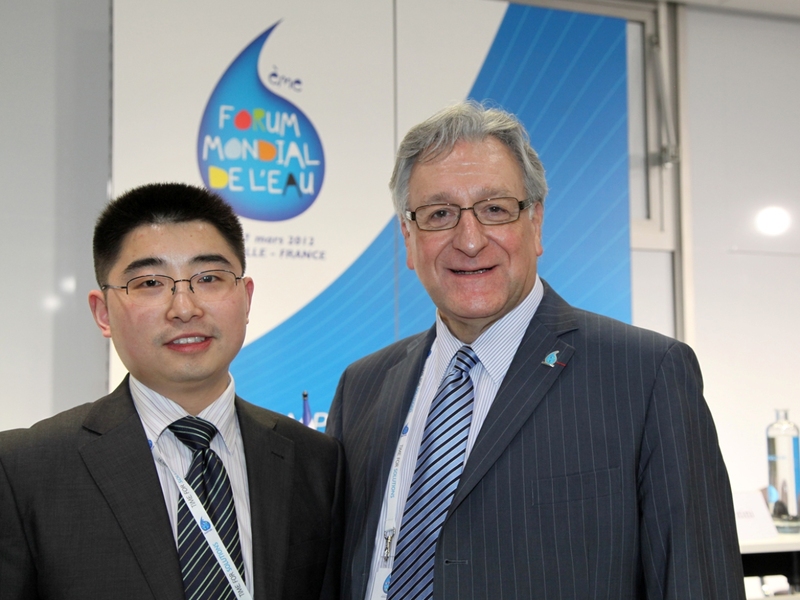 LI Junyi, communications officer for EFC, who is writing a thesis on Water Law, was present at this 6th forum where he had interesting exchanges, particularly with members of the Chinese delegation. 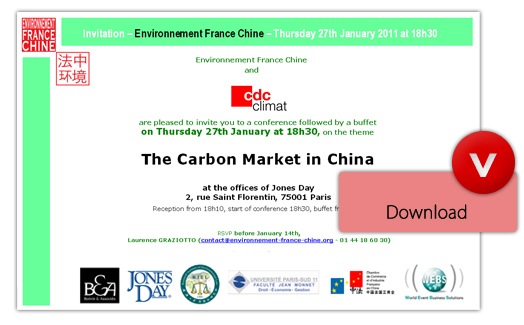 EFC was present at the Environmental FORENSICS conference 2012, organised in Paris on February 1st and 2nd. Anne-Caroline Urbain gave a presentation on the following theme: « Environmental Forensics & China: Legal Issues and Trends ». 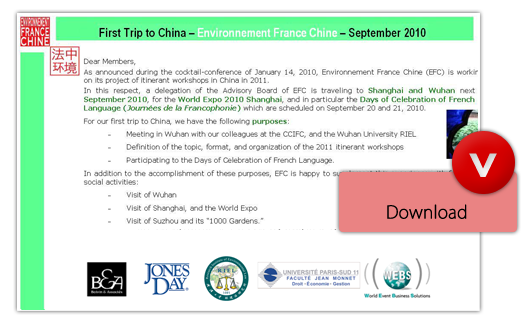 Invited by Professors Wang and Cai from Wuhan University, a delegation from EFC, Manuel Pennaforte, President in France and Li Junyi, Communications officer, took part in the annual conference of the Association of Research on the Protection of the Environment and Resources in China which was held from 6th to 8th August 2011 in Guilin, in the region of Guangxi. 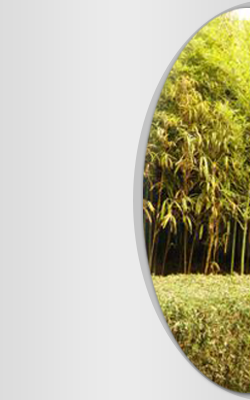 This Association brings together on a national level all the associations and local organisations responsible for the environment and plays a leading role in the reflection on Environmental Law in China. 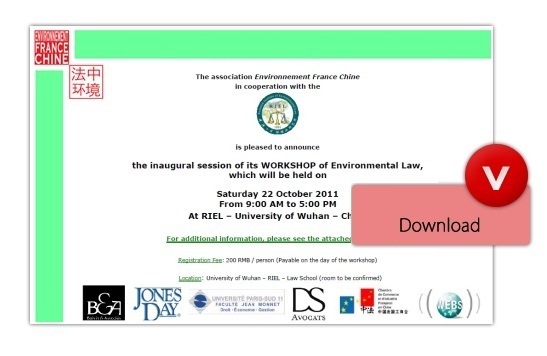 At the conference Manuel Pennaforte and Li Junyi gave a presentation explaining Industrial Environmental Law in France from a comparative point of view. 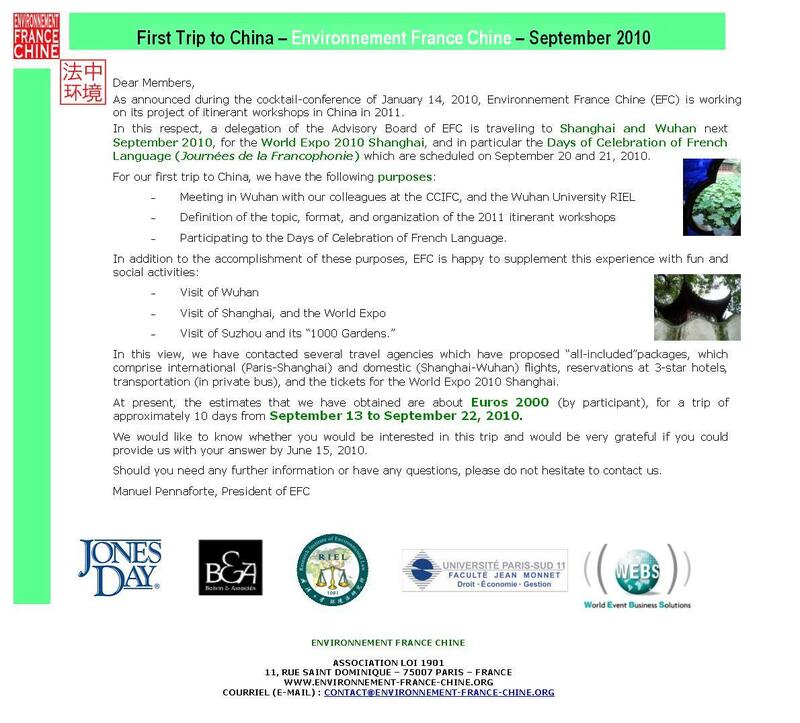 A delegation from EFC was present on June 27th at the Chinese Cultural Centre in Paris to celebrate the 10th anniversary of the Chinese–French Centre for training and legal exchanges in Shanghai. Founded in February 2001 in Shanghai and co-directed by Mme Marylise Hébrard and Mme Xu Qing, the aim of the Centre is to strengthen the links between French and Chinese notaries both from a technical and personal point of view and to collaborate with the Association for notaries in China in the organisation and implementation of training programmes for Chinese notaries and their French colleagues. 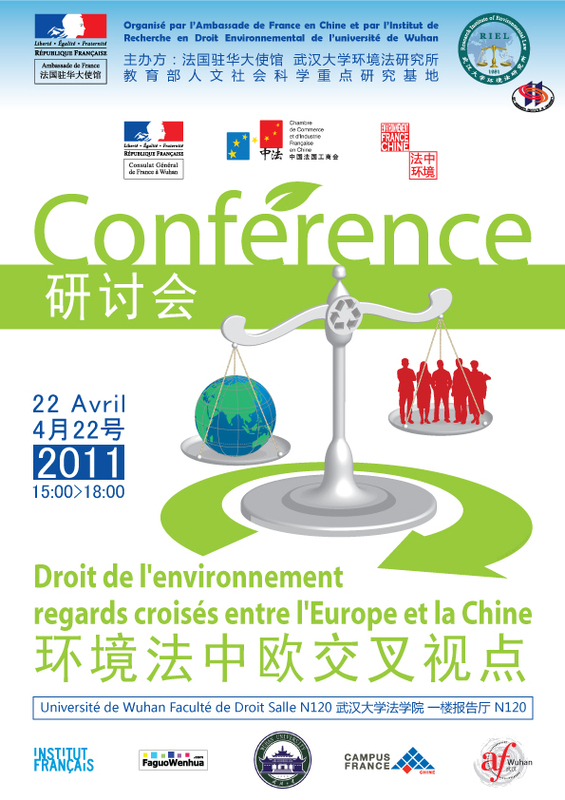 The committee members present in Paris were pleased to welcome the visit of EFC’s President in China, Professor Qin Tianbao, on May 6th 2011. The visit consisted of a meeting where numerous themes regarding French-Chinese co-operation were worked on and a dinner was shared in a warm and convivial atmosphere. 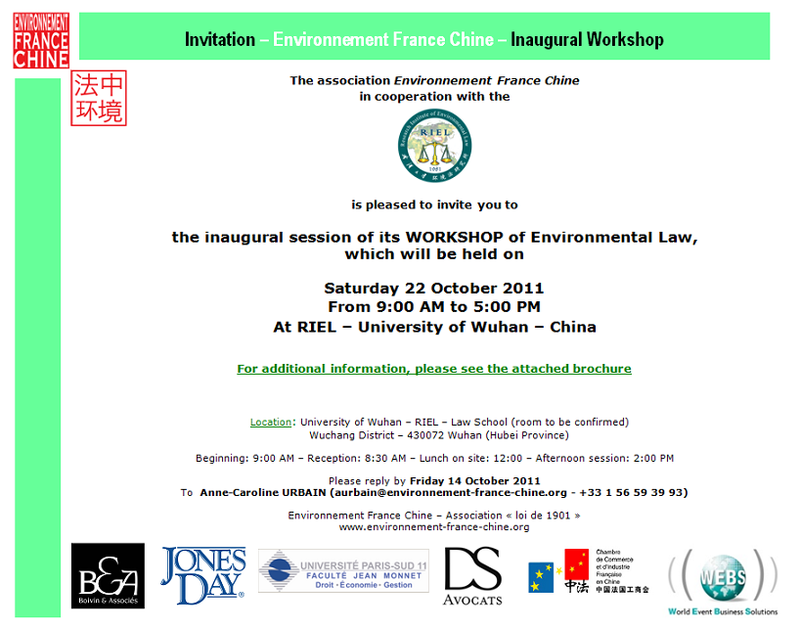 "Environmental Law, the view from China and Europe"
As part of a season of conferences on the environment, Jacqueline Morand-Deviller, professeur émérite, University Paris I Panthéon-Sorbonne, and Mme DU Qun, professeur at the University of Wuhan will make a comparative analysis of Chinese and European Environmental Law. In French and Chinese. Entrance free, number of places limited. EFC was present at the 10th session of the international conference INTERSOL 2011, organised in Lyon from 28th – 31st March 2011. 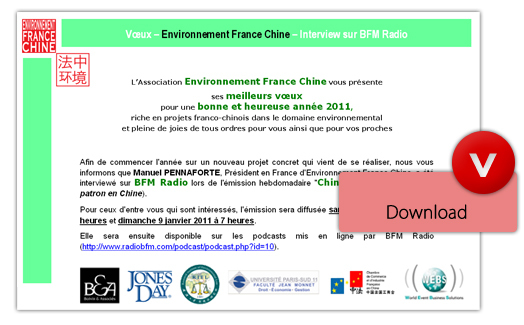 Manuel Pennaforte and Anne-Caroline Urbain gave a presentation on the following theme : “Environmental Impact Assessment in France and China”. 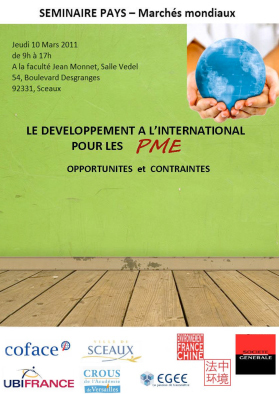 "International Development of Small and Medium-sized businesses: Opportunities and Constraints"
to be held on Thursday 10th March 2011 from 9h00 to 17h00, Salle Georges Vedel (Faculty Jean Monnet). A buffet lunch will be provided between 12h00 and 13h30. Entrance free. 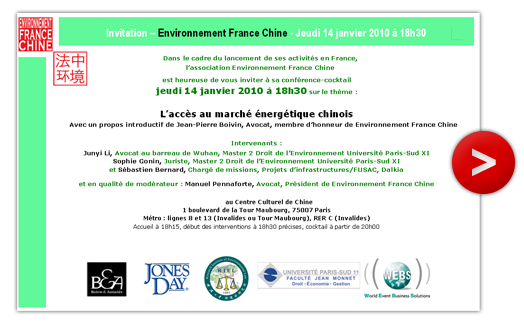 This event is organised with the participation of : Environnement France Chine, Société Générale, UBIFrance, COFACE, EGEE (Entente des Générations pour l'Emploi et l'Entreprise), Ville de Sceaux and CROUS de l’Académie de Versailles. Manuel Pennaforte and Anne-Caroline Urbain will give a presentation on the theme "Industrial and Environmental Projects : How to avoid the pitfalls?". 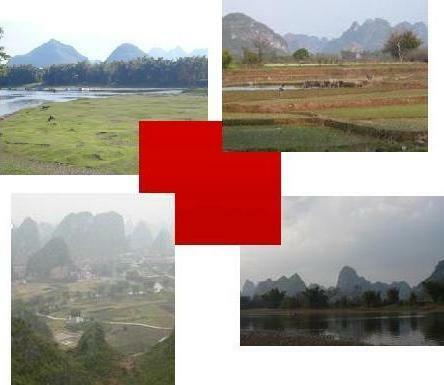 They will highlight the difficulties in setting-up industrial projects in China from the point of view of environmental requirements of local law. They will also present the reasons why it is essential to involve the different bodies concerned (companies, administrations, environmental experts, etc.) in order to ensure it is clear which legal constraints are applicable. 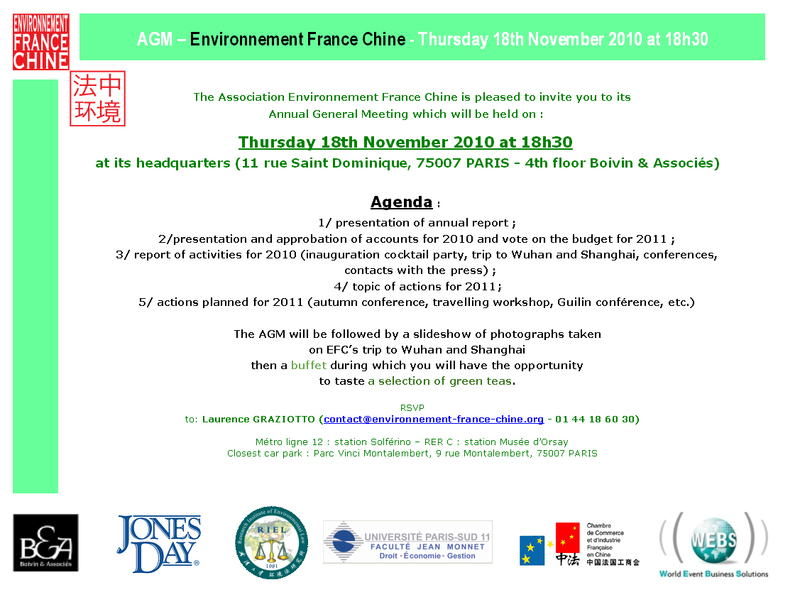 The independent Think Tank on China, The China Institute held its autumn conference on 7th October 2010 on the theme ‘Green development for China – new opportunities for French-Chinese co-operation”. 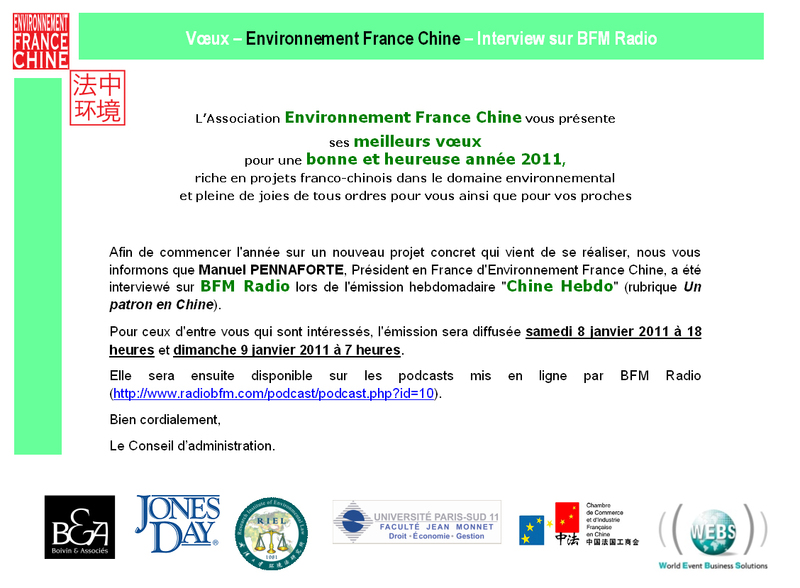 Manuel Pennaforte, the President in France for ‘Environnement France Chine’, was invited to speak on a panel of French and Chinese speakers. A delegation from ‘Environnement France Chine’, headed by Manuel Pennaforte, its President in France, was present at a colloquium organised by the Consulat Général de France in Shanghai to mark the celebration of 40 years of “francophonie”. This colloquium, which was held at Fudan University on the theme of “French, the language of success”, grouped together researchers, professors, intellectuals, writers, students and also entrepreneurs from French-speaking countries and China. They had come to share their experience of the diversity of French culture at round tables dedicated to the French language. Manuel Pennaforte took part in the round table on the theme of “French as a business language”. 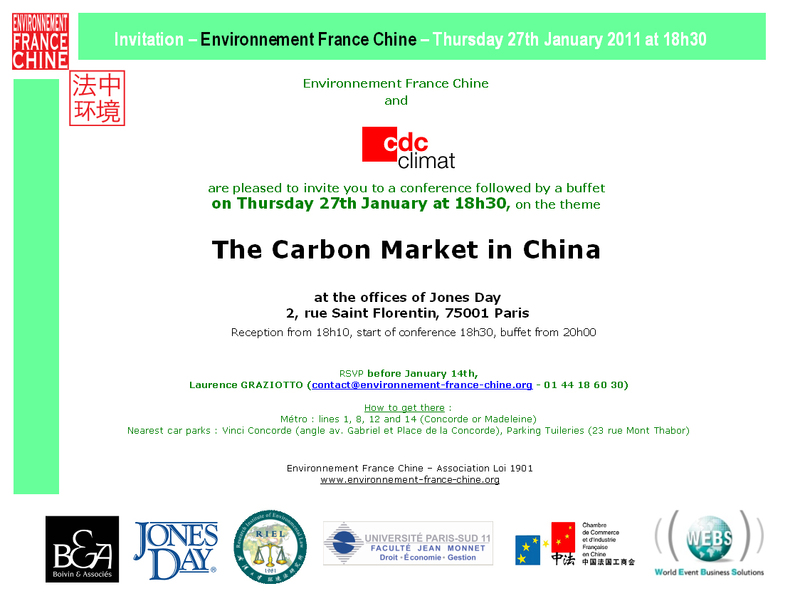 Also taking part were Mr Jean-Pierre Boivin, (France), Lawyer at the Paris Bar and founder of the Master in Environmental Law at Paris XI University and honorary member of EFC, Mme Guilhène Maratier-Declety, (France), director of international relations at the CCIP, Mr Chen Xiaoyun, (China), formerly a student in France, now working for DS Avocats, (Peking office), Mr Zhang Maolun, (China), formerly a student in France, now working for CNPC (China National Petroleum Corporation) and Mme Zhang Zumei (China, Switzerland), representative of the company Monodor. These discussions were chaired by Dr Jean Marie Cishahayo (Burundi), professor and consultant at the United Nations, main advisor on the participation of African countries at Expo 2010. 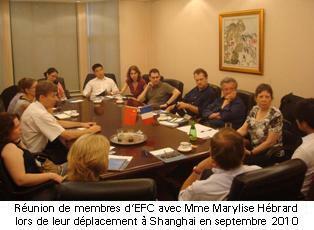 During EFC’s trip to China from 13th –- 22nd September 2010, a meeting was held with French companies based in Wuhan and the surrounding districts. This meeting was organised by the Wuhan branch of the CCIFC which is directed by Paul d’Azemar. 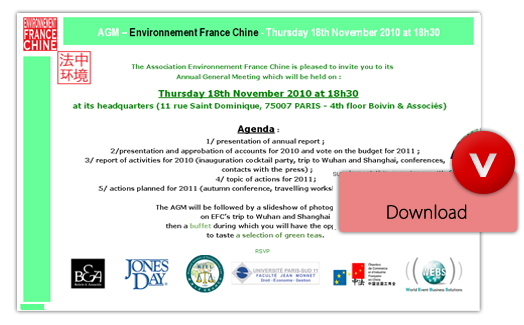 A presentation on the theme of “The opening and extension of an industrial site in China – Identification of environmental issues” by members of EFC was followed by a series of exchanges with the audience on environmental issues in China and possible solutions drawn from French and European experiences. The evening continued with dinner.